On July 17, 1917 in Taylorville, the wife of a Lithuanian miner, Mrs. Victoria Abroms (Abramaitis?) committed suicide, leaving behind two small children, because she had lost a precious $20 bill. It is difficult to imagine the depths of poverty and domestic violence that left this young mother no other escape from the crisis of losing about five days of mining wages—likely saved from household expenses over weeks or months. The Illinois State Journal reported that, “fearing her husband’s wrath,” Mrs. Abroms drank carbolic acid and died almost instantly. Derived from coal tar, carbolic acid, or phenol, was used back then as an antiseptic, especially in soaps. (Mrs. Abroms probably made her own soap and had a ready supply.) During World War II, the Nazis used injections of phenol in individual executions of thousands of prisoners. Toxic to the central nervous system, it causes severe muscle spasms, then sudden collapse and loss of consciousness. Many other Lithuanian immigrants of the “first wave” experienced not opportunity in their new land, but a stacked deck. It’s likely they would have had an even rougher go of it back in the Lithuania of that time. Nevertheless, it’s important to remember that for some, immigration was not a panacea, or even, ultimately, a path to survival. According to the Illinois State Journal, Anton (Antanas) Garulis was shot to death while running with a basket of stolen grapes from the fruit farm of J.W. Cogdall east of Springfield in August 1906. Probably an under-employed coal miner, Garulis was with another unidentified man when caught in the act of grape thievery by 17-year-old Dwight Cogdall. Young Cogdall ordered the men to stop, and when they ran, he started shooting with a revolver. Garulis was hit above the hip, and the bullet “went high,” injuring internal organs and causing him to die later in the hospital. His young shooter posted bail on a warrant of manslaughter that was issued as “a matter of form.” I believe the boy ultimately was not tried. In October 1905, Lithuanian immigrant Samuel Buckewitch (Bukevicius? ), of the Ridgely neighborhood on Springfield’s north side, was convicted of larceny for picking up fallen coal along the railroad tracks running from the Jones & Adams mine. Although the four bushels of coal found in his home, no doubt stored for winter, were worth only 28 cents, his fine and court costs amounted to $9.10. According to the Illinois State Journal, this penalty was enough to have bought a whole wagon load of coal (if Buckewitch had had that much cash in the first place). It is not known whether he was able to scrape together enough from friends and relatives to pay the fine, or whether he went to jail just for trying to stay warm. “Their husbands were out of work, their children were hungry, and so they stole,” reported the Jan. 23, 1918 Illinois State Register. But stealing from a railcar is a federal crime, and the railroad does not forgive. Four Lithuanian women, “three with babies clinging to their skirts,” pleaded guilty in federal court in Springfield, having been shipped here from Granite City, where they were arrested for stealing flour from railcars “engaged in interstate traffic.” Mary Kovich, Mary Savaoda, Katie Kranachivic, and Ann Artolian were their reported names (perhaps the newspaper was wrong and only two were Lithuanian: Kovich and Kranachivic). Mrs. Kovich’s 13-year-old daughter was brought along to act as court interpreter in English, Serbian, and Bohemian, in addition to Lithuanian. The four arrested women each pleaded guilty and were charged the minimum fine: $25 plus court costs, according to the newspaper. However, none could pay, so they were remanded to the county jail in Carlinville to serve 30 days. If not, I wonder if the children would have served jail sentences with their mothers. Miners’ wives were usually expected to earn extra income for the family by “boarding” multiple single miners along with their own families. This exposure in close quarters drastically raised the potential for domestic abuse of women and children, especially if we consider factors like alcoholism, criminal/vagrant tendencies and mental illness that might have kept many of the boarders perpetually single in a marrying culture. 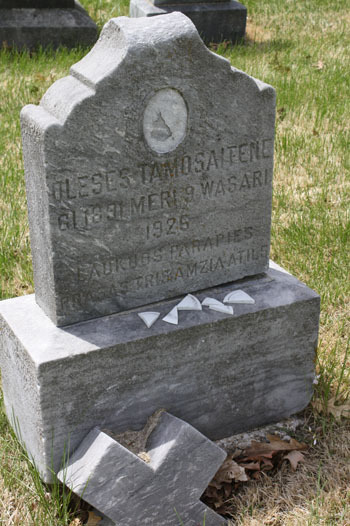 The grave of Alice Tamoszaitis (Tamosaitiene), Calvary Cemetery. 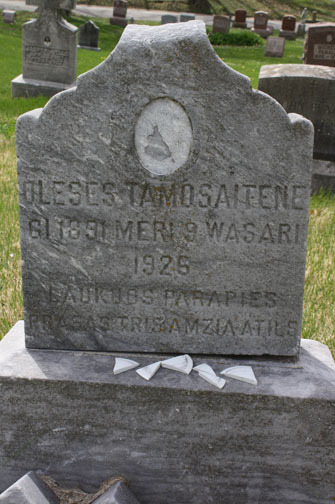 Headstone translation, correcting for misspellings: Alesė Tamošaitienė, June 1891 to February 9, 1926, Laukuvos Parish. Three Will Pray (or Pray Three Times), Rest in Peace. I first spotted this information last year in a Sangamon County Coroner’s inquest book while I was looking up the facts of another immigrant’s death. Then just a few weeks ago, while perusing a newspaper article (shared by Tom Mann) for information on a miner’s death, I spotted a column by A.L. Bowen that must have been referencing the Tamoszaitis murder. Dated March 11, 1926, just weeks after the crime, Bowen’s column described how an un-named mother and wife was killed by a boarder who rushed into the dining room of her humble home, brandishing a revolver. “Pointing it at the mother, he accused her of placing poison in his food, and before the eyes of (her) husband and children, shot her down and turned the gun upon himself,” Bowen wrote. Besides timing, another reason why I think this refers to the Tamoszaitis case is that official newspaper accounts of her fatal shooting note that the killer subsequently shot himself and was taken to the hospital. In lamenting the tragic shooting death of a wife and mother, Bowen noted, in language familiar to our own age, that the husband and neighbors had noticed the shooter acting strangely for some time. “Underlying symptoms of a dangerous (mental) disease,” he wrote, “were recognized but not understood.” Bowen went on to draw parallels between mental/nervous illnesses more rampant than tuberculosis, yet much less understood, diagnosed and treated. Due to the rigors of the mining life and the scant emotional and educational resources many Lithuanian immigrants undoubtedly brought to that life, which were progressively eroded, I shudder now to think of the likely abuse endured by so many immigrant women and children at the hands of their own countrymen inside their own homes and neighborhoods. Again, my sincere thanks to Tom Mann for unearthing these stories, which I share out of respect for the truth and the lives of the people involved. May they rest in the peace they did not enjoy in life. And here we are almost a hundred years later, hopefully things have improved, but certainly not for all immigrants in the US. These stories reveal once again the personal day-to-day struggles and often injustices of immigrants here in Springfield (and I’m sure in other towns). Thank you for sharing your findings.